If you build a perfect castle, a dragon will move in – and that’s exactly what happens to one very lucky boy when his family gears up for some changes. The boy and his dragon bounce in their castle, duel with delight, and have an amazing time together…until they find out that their castle is a crib for a new baby. Huh? As soon as they get used to the news, the boy and dragon are back in roaring form, entertaining the infant with marching music, aerial acrobatics, and baby-bottle bowling. But merriment turns to mischief and mischief leads to consequences. Can a dragon friend – real or not – help smooth the transition to big brotherhood? 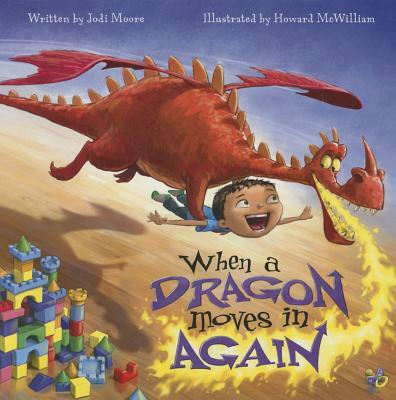 Find out…When a Dragon Moves In Again. Jodi Moore is the author of the award-winning When a Dragon Moves In. She lives in Boalsburg, Pennsylvania. Howard McWilliam is the award-winning illustrator of I Need My Monster and When a Dragon Moves In. He was chosen as National Young Cartoonist of the Year at the age of 12. A regular cover artist for the Week magazine, he also illustrates for the Sunday Telegraph, Moneyweek, and Outdoor Life.